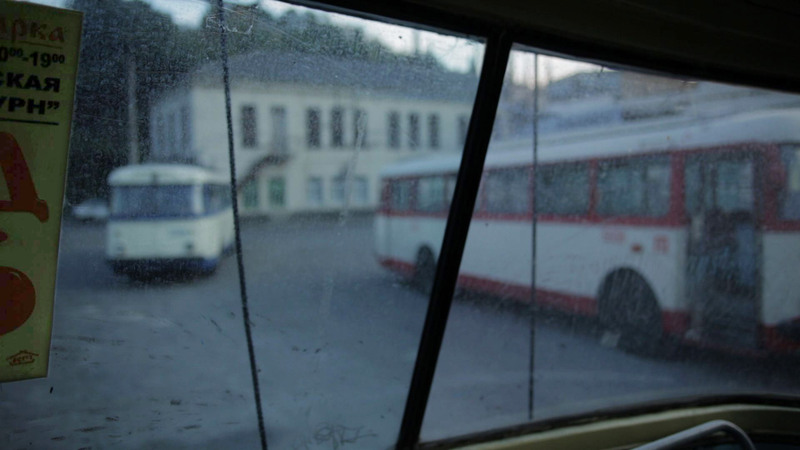 "52"-The Trolleybus, is the story of a Communist institution, its last gasp and the dedicated people that try to keep it alive. In 1961 construction of the worlds currently longest trolley bus line was completed. Located in what is today the Republic of Ukraine, the fully electrified fleet of buses connects the Crimean capital of Simferopol with its famous seaside resort town of Yalta. The Krymtrolleybus institution has somehow managed to survive the changing political and social currents of the last 50 years. Ukraine is a country notoriously famous for its unpredictable and dangerous drivers, yet, against all odds, the trolleybuses have accrued a great safety record, while providing a vital public service to an underserved community. Although underfunded and working with long since outdated equipment, the dedicated employees of Krymtrolleybus department have managed to keep the buses running on schedule and safe. Many of the spare parts needed for repairs have to be made from scratch. Much of the equipment has to be lovingly maintained far beyond its designated retirement age by people well beyond theirs. buses efficiently and effectively. The sentiment within the company seems to be, that the imminent relocation will inevitably lead to demise of the institution, as it exists today. As a result, a massive fleet of mini buses is threatening to become the only means of local transportation. Omnipresent, loud and environmentally unregulated, these buses are aggressively operated in a grey zone of legality. The elderly, young and handicapped along with the thousands who cannot afford a car are heavily reliant on the trolley buses for their every day mobility. Minibuses are comparatively expensive and taxis unaffordable. The constant jockeying for passengers makes access to the designated trolley stops dangerous and difficult. Also, paradoxically, to some people in charge, the ecological benefits of an emission-free fleet of buses seems to be of minor importance to a region that has been historically known for its healing air qualities and relies on its tourists to feed the merciless capitalist economy of this time and age. This documentary attempts to shed light on the colorful history, complex inner workings and davidian struggles of an anachronistic institution and its uncertain future in an aggressively capitalist country that has one leg still planted in its communist past.